Derby the East Boynton Dental Therapy Dog in Action! Fernando was very fearful. Derby to the rescue. Fernando got his teeth fixed and Derby made a friend! A friendly reminder: don’t forget your six-month checkup! Get your six month check-up! Meet Derby the Dental Dog! 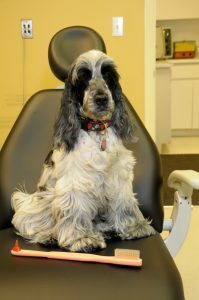 Derby the Dental Dog Welcomes You to East Boynton Dental! At East Boynton Dental we pride ourselves on making you comfortable while delivering the highest quality dental services. Derby, our “Dental Dog” is often in the office to greet patients, play with the children and generally put people at ease! She also contributes weekly tips to our Facebook page to help you keep your smile bright! Like us on Facebook and keep up with her latest advice to keep your teeth healthy!